St. Ludmila, patroness of Bohemia was born around 860 in Mělník and married at an early age to Bořivoj I, Duke of Bohemia. After their son Spytihněv died, his brother Vratislav succeeded to the dukedom. Vratislav’s wife Drahomíra had remained a pagan, and grew increasingly resentful of the influence of Ludmila over their son Václav. She had been largely responsible for the upbringing of her grandson and when Vratislav died in 921, Ludmila, now a widow, acted as regent for the young Václav. Drahomíra’s jealousy became so intense that on 15 September 921 she despatched two assassins to murder Ludmila in her castle at Tetín; tradition has it that they strangled her with her own veil. Her body was initially buried in the castle church of St. Michael, but at some date before 1100 it was reinterred in the basilica of St. George in Prague. 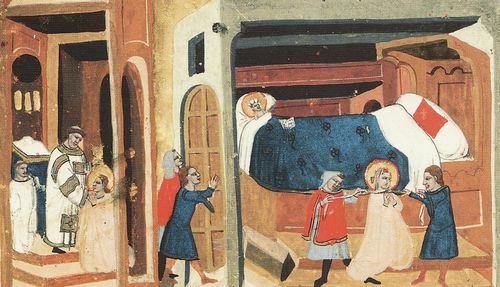 Veneration of the saint, who was canonized shortly after her death, grew rapidly, and she was honoured (together with her grandson Václav, subsequently murdered by his half-brother Boleslav the Cruel) as one of the patrons of Bohemia, as well as of widows, converts, duchesses and (not surprisingly) those experiencing difficulties with in-laws. Her fame spread far beyond Bohemia throughout the entire Slavonic world, where her name is still highly popular among both Orthodox Christians and Roman Catholics.